Overlay histogram showing MEF cells infected with d138 MCMV, stained with 1:50 Ab M55.02 (red line) and 1:100 FITC-conjugated anti-mouse IgG. 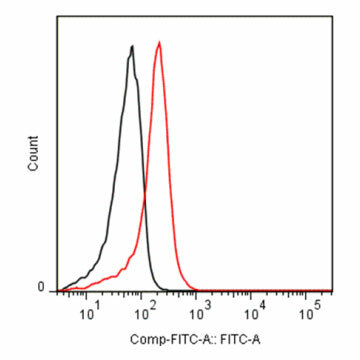 Isotype control antibody (black line) was mouse IgG used under the same conditions. 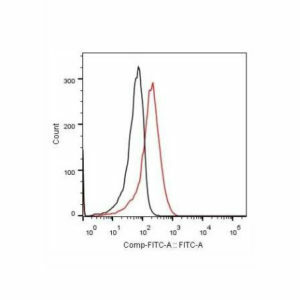 Our monoclonal antibodies, clones CROMA 7, m55.01 and m55.02 recognize MCMV protein m55, also known as gB. gB is a major envelope transmembrane glycoprotein, part of the protein machinery promoting the fusion process involved in virus entry. 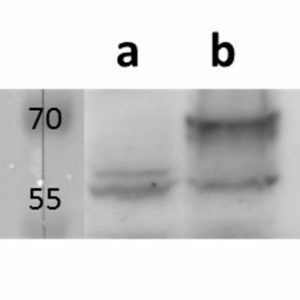 It is encoded by a gene transcribed in late phase of infection (after 16 h p.i.). gB is highly conserved among different herpesviruses and is a major target of virus-neutralizing antibody responses in CMV-infected animals and humans (Britt WY et al, J Virol, 1990). 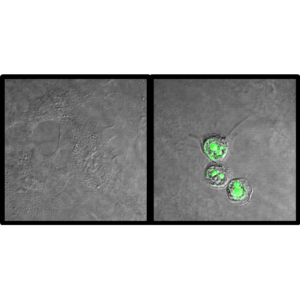 In addition, HCMV gB is also involved in cell adhesion and signaling capabilities (Boyle, KA et al, J Virol, 1998; Boyle, KA et al, Mol Cell Biol. 1999.) gB is present as several protein isoforms of different molecular masses, with the 130kDa form being precursor protein (Rapp, M et al, J Virol, 1992). 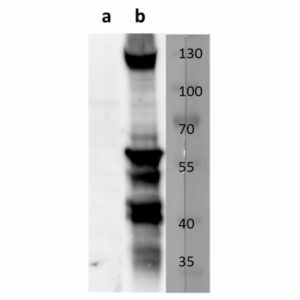 It has been proposed for HCMV that a cellular protease cleaves precursor gB resulting in additional protein forms of lower molecular mass (Spaete RR et al, Virology 1988). 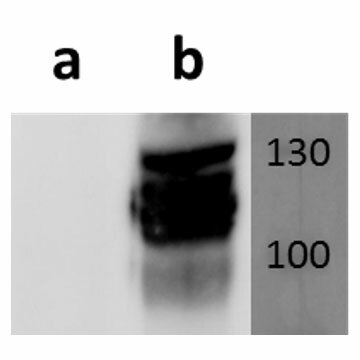 This can be also observed in MCMV-infected cells stained with our M55.01 clone in western blot where clone M55.01 recognizes all gB forms whereas clone M55.02 recognizes only the highest molecular weight form (130kDa). 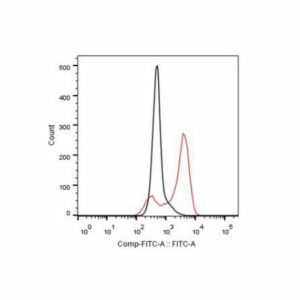 Our anti-M55/gB antibody clone M55.02 has been validated in flow cytometry (MCMV infected cells) and in western blot (MCMV infected cell lysates). Long term -20 °C, short term +4 °C. Avoid freeze-thaw cycles. 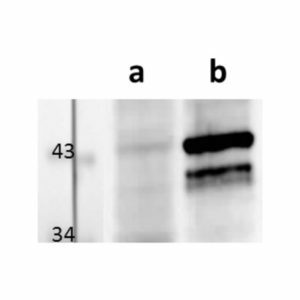 The monoclonal antibody m25C.01 recognizes MCMV protein M25. ORF31 is one of five glycoprotein ORFs in VZV genome. 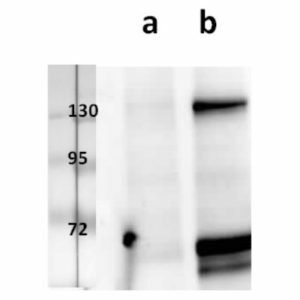 It encodes for gB, a type I membrane protein containing 868 aa which in mature form exists as a highly glycosylated disulfide-linked heterodimer (Annu Rev Microbiol 1990. 44: 59-80). 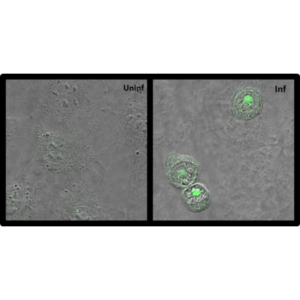 m155 is a mouse cytomegalovirus (MCMV) 43-kDa glycoprotein expressed in endoplasmic reticulum and cis-Golgi compartment of infected cells (Loewendorf et al., 2011, Journal of Virology, 85(10), 5208–5212). MCMV early protein 1 (E1), encoded by murine cytomegalovirus (MCMV) M112-113 gene region localizes predominately to the nucleus of MCMV-infected cells (Ciocco-Schmitt et al., 2002, Virology, 294, 199–208. ).